The Hindsgavl Castle, Denmark, has its own ghost roaming the grounds. She is called The White Lady and bears a tragic story. On the day of her wedding, the coach carrying her to Hindsgavl crashed into a pond, and she got stuck in the coach and drowned. 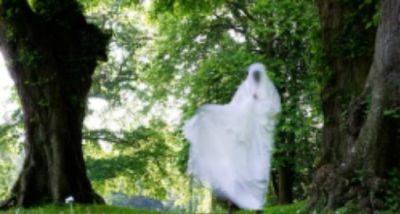 Now she is looking for her husband mainly in the park at midnight, but she has been spotted a few places around the castle as well. She only approaches men, as she seeks for her husband, and people say she disappears with a sigh, when she discovers none of them are her husband. It is also said that the ring for her finger is still somewhere around the castle. My wife and I celebrated Christmas 2014 at Hindsgavl Castle and late night on Christmas evening I chatted with Stan Loh and told him the story about the ghost. And his reaction was "I think we have a new project". Few days later he sent me this fantastic song. I added some musical details including the long opera/choral middle part and added other bits and pieces. Stan contacted Steve Hales and asked him if he would sing the song. Steve took the challenge and started working hard on it. And here 6 weeks later the result is here. I think his vocal work is fantastic. Lights through worn pine floors! “Pull hard good stallions”, she cries, the trumpets call! Silence through old oak doors.